The handsome Indian-American woman was friendly but resolute in hailing me as I headed for buffet seconds at Swad Indian Restaurant in the town of Monona, just across the lake to the southeast from downtown Madison. I couldn’t help but smile. 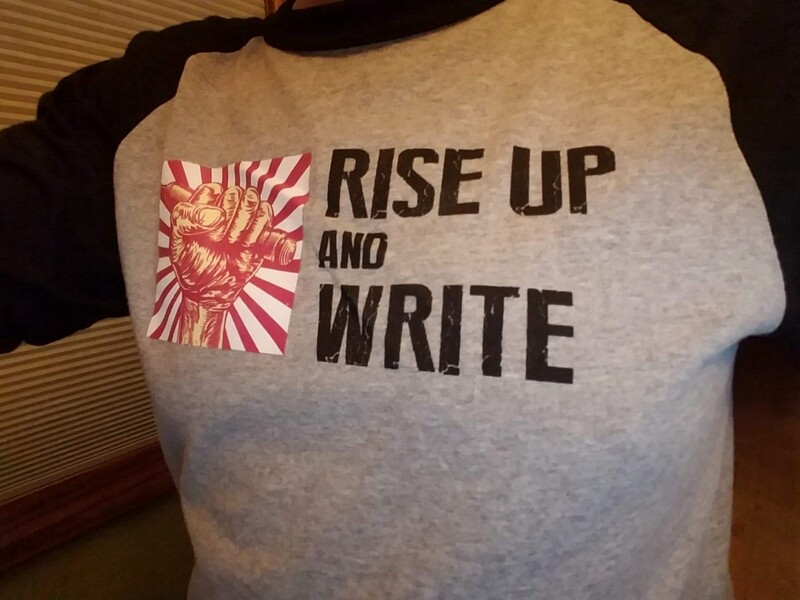 First, because she obviously had noticed my brand new “RISE UP AND WRITE” t-shirt, a memento of my participation in the first Midwest Conference of the National Writing Project at the University of Wisconsin. I also smiled remembering the firm injunction in Writing Project practice to insist that people (especially teachers of writing) claim their identities as writers. So I answered in the spirit of the Writing Project. She subtly but noticeably shifted gears (I sensed that we were now doing business) and gestured toward the older of her two daughters standing nearby at the table where they had all just finished their lunch. The teenage daughter smiled awkwardly and looked at her younger sister, but made no effort to reply to my question, which had been directed partly to her, partly to her mother. She knew she need not answer; her mother would handle their end of the conversation. As she had been since well before she began our conversation, the mother was two steps ahead of me. “Yes, I wonder though, I believe they said that she should plan to spend a month editing her book. Is that normal, do you think?” Apparently the call to deep revision did not sit comfortably with the mother, who seemed (like any good literary agent) eager to get her daughter’s novel on the bookstore shelves — and then to Hollywood — without delay. I reflected for a moment on my career-long struggle to get writers of all ages to embrace revision as the most powerful tool a serious writer has to improve her writing and deepen its impact. I delicately replied to her question: “I think it depends on the writer and the book. Many very fine writers take a great deal of time and effort to revise their work before submitting it for publication.” I recalled tales told by Wordsworth biographer and scholar Stephen Gill about the poet accosting the mail carrier the day after Wordsworth had posted a poetry manuscript addressed to his publisher. The poet would demand that the poor postman hand over the already-mailed document — a blatant violation of English law — so Wordsworth could fix one line in a hundred-line poem before mailing it off again. “Thank you very much for your time and your thoughts. Have a good afternoon,” said the mother. The daughter looked relieved to see her mother’s intervention draw to a close. I was delighted to have learned about the young woman’s literary accomplishments and to have made contact with the mother to share thoughts about writing, Young Writers Camp, and The Writing Project. As I served myself a second helping of Gobhi Manchurian, I reflected on how I love my “RISE UP AND WRITE” t-shirt not only because it is retro, political, and promotes the power of writing, but also because it announces to the world a thing about me that has always been true but is usually invisible: that I love writing and writers, that I am a champion for both, and that I love talking with people about their writing. And that goes triple for talking with strangers. I teach and research at Illinois State University in Normal, IL.